The 2019 Toyota C-HR is one of the newest additions to the Toyota lineup having just been introduced in 2018. Just a year later, the C-HR is already getting some updates including the addition of two new trim levels and more standard and available features. It is available in three trim levels: LE, XLE, and Limited. The 2019 Toyota C-HR is powered by a sprightly 2.0-liter inline 4-cylinder Dynamic Force Engine with advanced Valvematic technology, earning 27 city and 31 highway mpg. * But the stellar performance of the 2019 Toyota C-HR doesn’t just come from its athletic engine: it also boasts superior drivability and handling to boot. 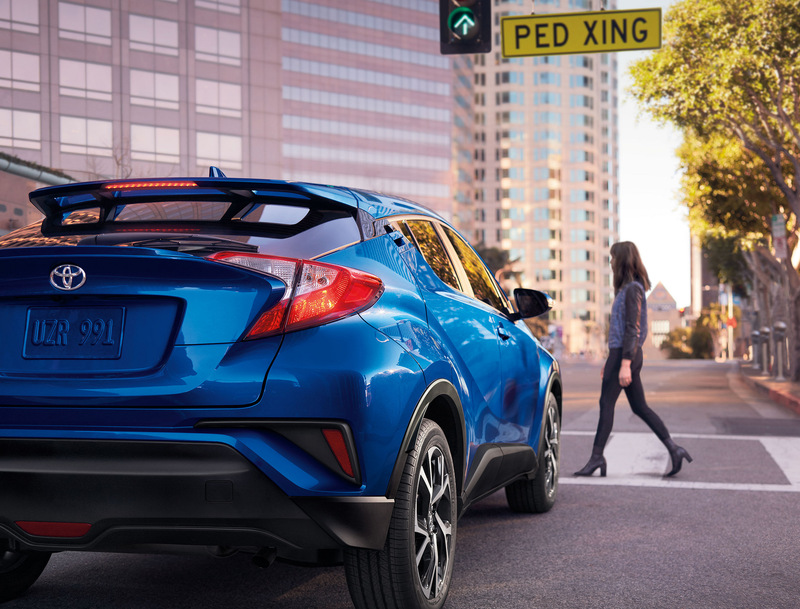 The new C-HR allows drivers to shift between two drive modes, Continuously Variable Transmission with intelligence and Shift Mode and the Sequential Shiftmatic™ Mode with seven virtual gears. Add this to its sport-tuned suspension, and you’ll feel like you’re hitting the track every time you get behind the wheel. It’s hard not to stare at the head-turning new 2019 Toyota C-HR. Its design is truly one-of-a-kind, with sharp yet graceful lines, an athletic silhouette, standard cluster LED DRL with halogen headlights, a cantilevered rear spoiler, and available vortex-styled 18-inch alloy wheels. Just as alluring as the striking exterior design of the 2019 Toyota C-HR is its attractive interior. Inside this one-of-a-kind ride, drivers will find available leather-trimmed seats; an available soft-touch, leather-trimmed steering wheel and satin-plated shift knob; available heated front seats; eye-catching blue interior accents; and standard dual-zone climate control. The C-HR comes standard with a 4.2-inch color Multi-Information Display. This puts vital vehicle information just a glance away. Whether you're the driver or a passenger, you're always cozy and content inside the premium Toyota C-HR. You take your safety seriously, and so does Toyota. That’s why the 2019 Toyota C-HR offers standard Toyota Safety Sense P™ (TSS-P), an innovative suite of four active safety systems. In addition to TSS-P, the new Toyota C-HR offers available Blind Spot Monitor and Rear Cross-Traffic Alert; a standard back-up camera; a standard ten airbags, including the Advanced Airbag System for the driver and front passenger; a high-tensile-strength steel body construction; and Toyota’s built-in Star Safety System™. The 2019 Toyota C-HR delivers on all fronts, from exterior and interior design to performance and safety. Test drive it today at Gilroy Toyota.